The holiday season or maybe winter in general, traditionally is baking season. 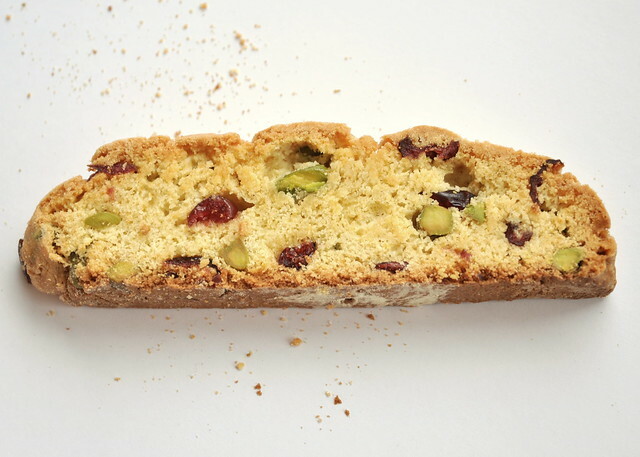 One of our home made favorites are these cranberry-pistachio biscotti (biscotti literally means baked twice). Even K. who doesn't have a sweet tooth at all or doesn't even care about desert, can't resist these. They have a nice nutty flavor to which the cranberries add the right amount of tang. I made a batch late Friday night and they didn't last through the weekend! The recipe is adapted from a Martha Stewart recipe. Preheat oven to 350° F/ 175-180°C. In a pan roast the pistachios until golden or slightly brown. Set aside. Put flour butter in a bowl and mix on medium speed until smooth. Add sugar and mix until pale and fluffy. Mix in vanilla and eggs, 1 at a time, until well combined. Add flour mixture at once and mix until well combined. Add cranberries and pistachios and mix with a fork until well combined. Transfer dough to baking sheet lined with parchment paper and dusted with flour. Pat into a long flat log. Dust hands with flour if too sticky. Bake until firm, golden brown and cracked on top and an inserted toothpick comes out clean, about 30 minutes. Let cool on a wire rack, about 20 minutes. Transfer to a cutting board and cut 1/2 inch thick slices using a serrated knife. Arrange slices onto a baking sheet lined with parchment paper and bake cookies until brown at edges, about 12-15 minutes. Let cool on a wire rack. Bon appétit!